Luke, over at Empire Begins is selling his 50cm Gangsta track. It’s about a month or two old and he’s got a series of pictures documenting its condition here. Contact him directly at this email to discuss. The frame is about a 58cm square – compact geometry. 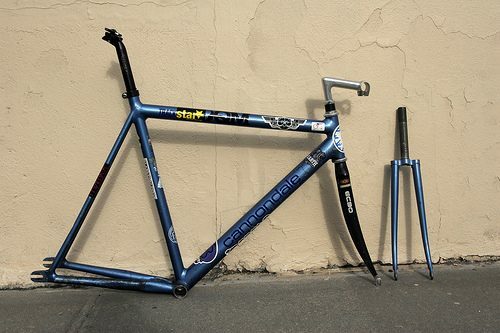 Frame, fork, headset, seatpost / clamp only – he’s also selling the wheels separately. 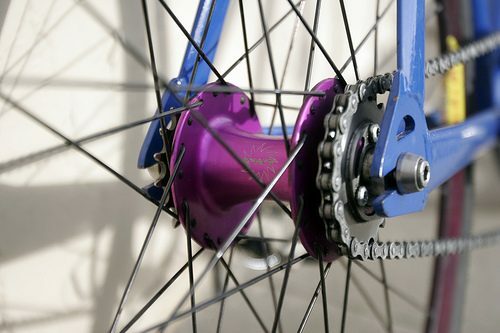 Purple Level hubs + Purple Deep Vs.
From the looks of it, his Cannondale track bike is for sale too. You know, the blue ones? It’s covered with street cred as well: small dings and stickers! I think it’s a 56cm. 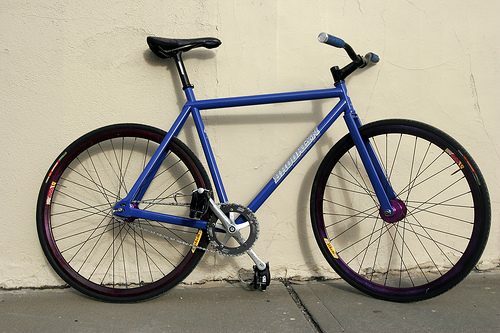 Perfect beater!